Catherine: A French literary classic with a twist. For a French audience used to the beauty and the poetry of the original text by Edmond Rostand the play may have come as a bit of a shock! This was very much a play adapted for an English audience, for a local audience in fact with the majority of the actors speaking with a strong Yorkshire accent! If the original text had been replaced by a vernacular dialogue full of expletives, there were however some interesting details such as the priest Le Bret speaking with an Irish accent. For me perhaps the most challenging factor was Roxanne’s obvious foreign accent. The pronunciation of the French names was also at times difficult to follow. For a linguist this was a little unfortunate! It may be that the playwright, Deborah Mc Andrew, wanted to go back to the origins of Cyrano de Bergerac a libertine seventeen’s century author. The swashbuckle very lively interpretation would have perhaps benefited from a different title in order to avoid the usual expectations linked to the play. An contemporary adaptation of the original – it certainly was …. An unexpected experience – it certainly was…. A lively evening – it certainly was…. 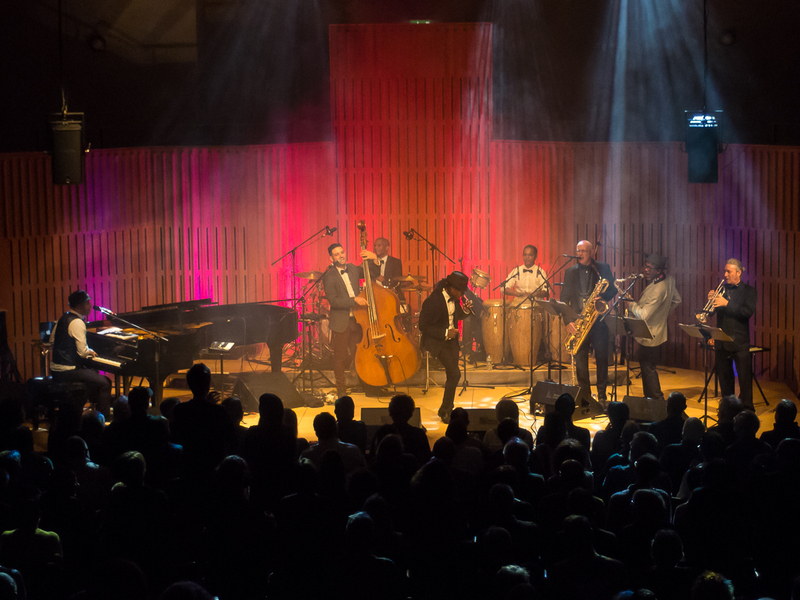 A theatrical tour de force – it certainly was…. A boring evening it certainly wasn’t!! 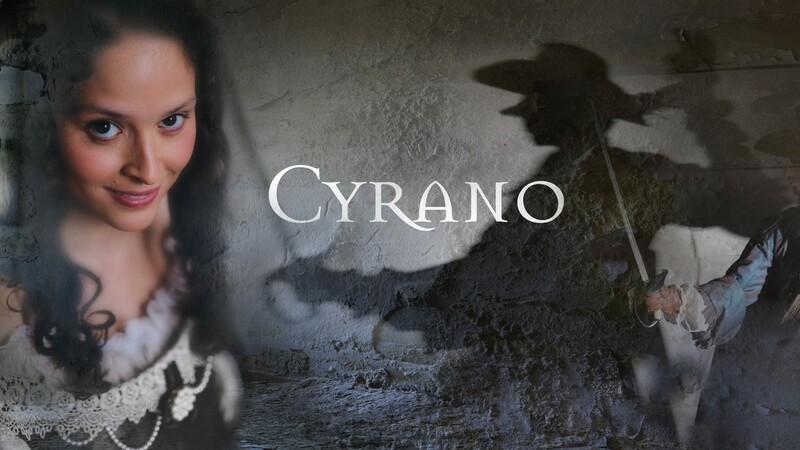 Christine: The recent YTI trip to see Cyrano at the York Theatre Royal was a real treat. I always enjoy going to the theatre but it was fascinating to see a play based on a French classic in the company of our French colleagues. This particular version was written by Deborah McAndrew for the Northern Broadsides and the New Vic Theatre. In summary, the play is a tale of unrequited love set in 17th century France. Cyrano de Bergerac, a brilliant poet and swordsman, is in love with his beautiful cousin Roxane. The tale ends in tragedy, but there are plenty of comedy exploits, songs, sword fights and acrobatics along the way. The production was visually beautiful with effective scenery and lovely costumes. It was an extremely musical version of the story; actors who are also good musicians are always impressive and enjoyable to watch. There was a strong comedic element, with jokes about Cyrano’s big nose and exaggerated tales of his prowess as a swordsman. All this was good fun. Also though, I have been surprised at how thought-provoking the production has been for me. One of the most enjoyable elements of the evening was discussing the play with French colleagues who have known it since their teens because their impression was so different from my own. In Northern Broadsides productions, actors perform in their natural voices so Cyrano was basically an adaptation, a quirky mixture of a swashbuckling French past and current English language. I loved the moments that caught the Northern voice because for me this gave an extra comic dimension, and in places added emotional depth. Cyrano is touring now, and even if you don’t fancy seeing it, I recommend having a look at http://www.northern-broadsides.co.uk/ to find out more about the company, Deborah McAndrew and this particular production. 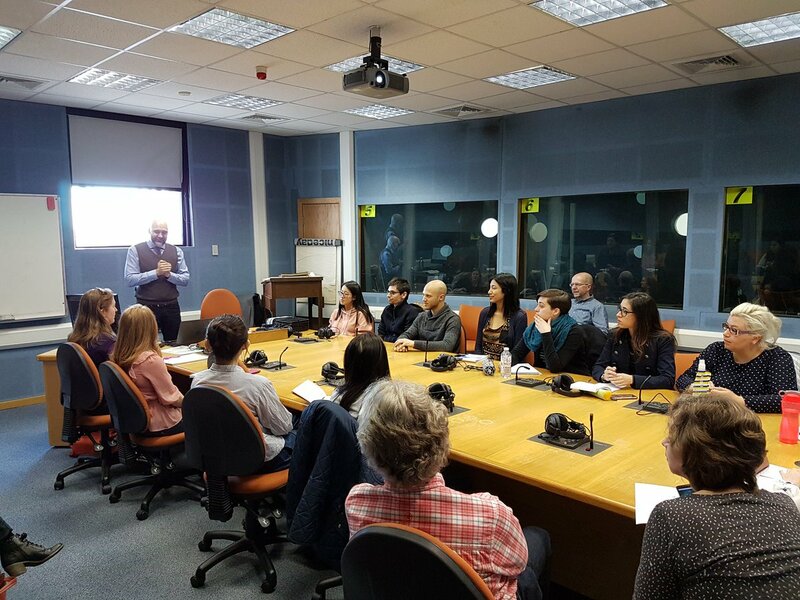 Saturday 25th March saw students and professional translators and interpreters alike assemble in the interpreting suite at Leeds University for a day of CPD in interpreting. The turnout was good, despite the tempting sunny weather outside, with a wide range of nationalities represented. The day was organised in two halves: the morning was an opportunity to hear veteran interpreter Martin Esposito discuss sustainability (or lack thereof) in the interpreting profession, followed by a practical session in the afternoon giving attendees the chance to interpret a variety of speeches in different languages using the university’s booths and some of Martin’s technology. Having trained in interpreting five years ago, but worked solely as a translator ever since, I was curious to delve back into the glamorous world of interpreting and update my knowledge. The morning’s session was fascinating, offering a glimpse into the exciting career of a successful interpreter. The main message that I took away was however that interpreting as it stands, whether conference interpreting or interpreting on the private market, is somewhat unsustainable. Martin cited the difficulties that interpreters experience maintaining relationships when they are constantly travelling internationally, preserving their health (ear infections were mentioned frequently as the bane of an interpreter), maintaining their waistline and retaining clients in today’s price sensitive market – particularly when a non-native CEO decides to have a go at speaking in bad English rather than using their trusty interpreter. Martin’s suggestion to combat the latter issue is to add value to the interpreting services you provide to the client, such as doing voice overs and translations for them, creating cloud-based glossaries for their use and even acting in a consulting capacity. In short, making yourself indispensable. In particular, though, he stressed the need for interpreters to be as self-sufficient and easy to work with as possible. After all, wouldn’t you rather work with a service provider who got on with the job and solved any issues themselves? In this vein, Martin discussed and demonstrated some pieces of technology that are a must have for an interpreter’s tool kit. Some were hardware, such as the smart pen that records a speech while you write notes and then plays it back when you select a section, and some were apps, such as an amplifier app to help in a situation where an interpreter cannot hear the speaker clearly. This was a recurring theme, and Martin showcased some different headphone and microphone options to facilitate an interpreter’s work in the most challenging audio situations. The bone conducting headphones, which sit a little in front of and above your ears, were particularly popular, with interpreters clamouring to try them out in the afternoon. After taking full advantage of the scrummy catering provided by Opposite Café with plenty of time to natter as linguists are wont to do when they get together, we headed back to the interpreting suite for some practice. After so long out of the booth, I was rather nervous about getting back on the interpreting horse, particularly surrounded by so many aspiring and seasoned interpreters. While I am most certain that everyone else found the practice most useful, I have to admit that the experience (and the stress of trying to listen and speak simultaneously AND make some kind of sense at the same time) has not inspired me to leave translating behind. However, Raquel had prepared a wide variety of interesting speeches to practice with, and there was some very impressive interpreting going on into a whole range of languages. In all, it was a thoroughly enjoyable day and fascinating to get an interpreter’s take on the language industry and its future. I would like to say a big thank you to our speaker Martin for giving up his Saturday to talk to us, and particularly to Raquel for organising the whole day, and, very importantly, the delicious food! Proving to be one of our most popular social events, every YTI member who attended, did so with another non-member (Remember our socials are open for family and friends!). We took our seats at the back row, from where we could enjoy a general overview of the whole Howard Assembly Room, which allowed us to follow the show in every detail. 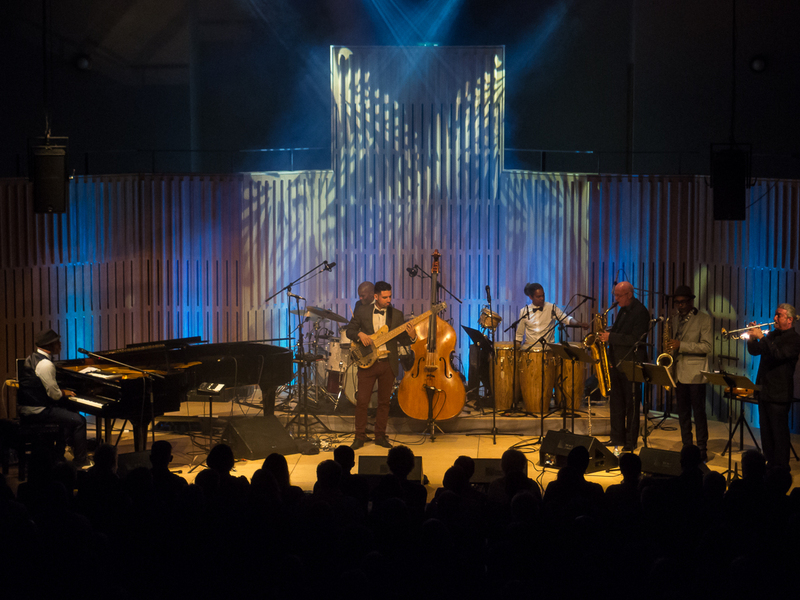 The concert started very much as expected, with an interesting mix between jazz and Cuban music, which developed into what could be considered a proper salsa party. Roberto Fonseca and his Cuban/Spanish band played songs from their latest album, ABUC; which is Cuba spelt backwards, as Roberto himself pointed during the concert. Songs like Tierra Sagrada and Afro Mambo got the public to their feet and many of them, including some of us, would have started dancing, if we had had our own stage. We also engaged with the singer, chanting in chorus, clapping to the rhythm, applauding even when we were not supposed to because the band was still playing. Roberto Fonseca created since the beginning a very enjoyable atmosphere, engaging with the public, thanking a million times and apologising another million for his broken English. If only he had known there was a whole host of translators in the room! The Afternoon Tea in York was only the second YTI event that I have attended, and I was really looking forward to meeting more fellow translators and interpreters and sampling some delicious baked goods from around the world. The afternoon definitely did not disappoint! The historic venue was cosy and atmospheric, the perfect respite from the miserable wintery northern weather (I have been told that the weather is sometimes nice up here but I have yet to see convincing evidence!). There was plenty of space for mingling and munching, although it might have been a bit confined for our most junior attendee, a definite linguist in the making and expert cupcake baker! 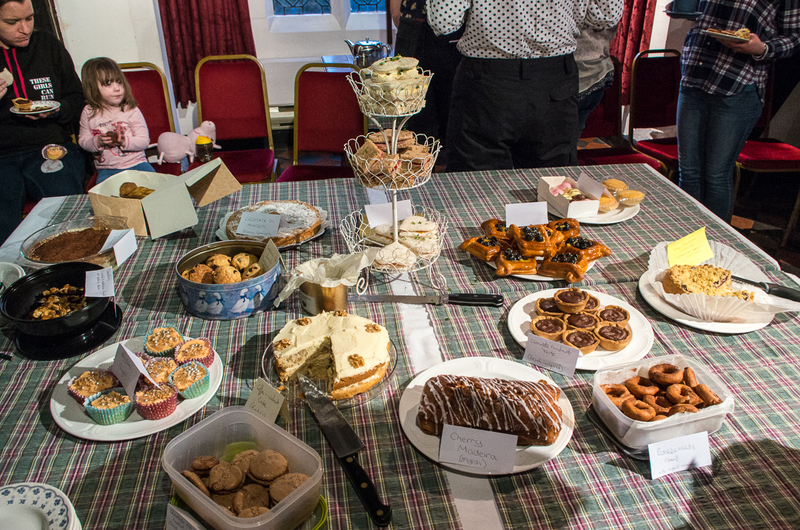 YTI members really outdid themselves with their baking, and the range of delicious cakes, biscuits and savoury snacks on offer from different countries around the world was impressive. Very, very sadly, I was unable to taste most of the things on offer due to a dairy intolerance, but my partner came along to the event, dutifully and valiantly reporting on the vast majority (he didn’t take much convincing). The verdict? Delicious of course! I was very proud to see that my own contribution, chocolate and hazelnut French-inspired macarons, flew out of their tub, especially seeing as it was my first attempt and I was convinced they would be a disaster! In addition to the baked goods, hot drinks were also kindly provided – my favourite being a Russian caravan tea that was so strong I left feeling a bit light headed (tea drunk?!). 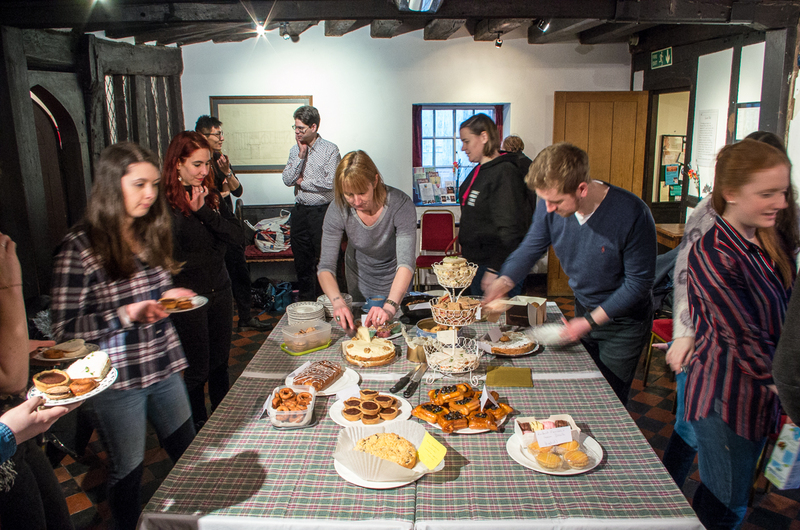 A good number of members and their family members put in an appearance, no doubt attracted by the promised treats. I am always amazed by anyone that can, saint-like, turn down the opportunity for cake. One member (naming no names) even told me she had been on a run in the morning to justify trying some of everything. The conversation was very varied and interesting, as to be expected from a group of such cosmopolitan language lovers as the likes of us. I had a whale of a time reminiscing about time spent studying and working in Russia in the snow and ice with a fellow Slavophile, and as expected met lots of lovely new faces. It was also great to see the YTI’s student members represented by a group from the Master’s course at Leeds University, who impressively managed to find time in their busy schedule of studies to attend. Once again, the event was wonderfully organised, and I would like to thank Charlotte for all her hard work and everyone who helped set up and pack away at the end. Here’s to next year and expanding our waistbands in international style! As a student member, and with the Corpora workshop being my first CPD event, I was a little unsure of what to expect during the session on 28th February, but I think it’s fair to say that everyone got a lot out of the session with Dr Ana Frankenburg-Garcia – a similar workshop to the one that she gave to the ITI last September, and one which was very popular! The event took place in the ERIC computer cluster at the University of Leeds (a room that I, along with the other students who attended, am almost too familiar with!) and started with a quick check of the attendees language pairs. 1) Parallel Corpora: these are corpora in which the source text and its translation are displayed in parallel (surprise surprise!) and are similar to Linguee, using, however, more principled and carefully selected texts. Some examples of parallel corpora are EurParl, using translated documents from the European Parliament and EUR-Lex, using translated documents from the European Court of Justice. 2) General Language Corpora: these are corpora which contain just one language, and can be used in a similar way to checking specific phrases in Google, but again, using more principled and carefully selected texts. Some examples that Ana provided were CREA for Spanish, DeReKo for German, and the British National Corpus for English. Ana did warn us that the BNC was created in the 90s so some of the information may be out of date – for example, ‘Internet’ barely features! 3) Specialised Corpora: these can be assembled using subject specific texts, and can help translators to get to grips with the specific terminology of a particular field. 4) Ad Hoc Corpora made for a specific translation or interpreting job: these can help a translator or interpreter to become quickly acquainted with the vocabulary that may be needed. After some refreshments we returned to the computers for a demonstration of how to use Sketch Engine (https://www.sketchengine.co.uk/ – there is a free trial avalible for anyone who is curious! ), before having a go ourselves. Ana showed us how to perform a concordance search to check which preposition should follow ‘married’, either with or to, and we were quickly able to see that in the context Ana had described, the answer was ‘married to’. We then moved on to collocations, and words that are associated with other words, the example that Ana gave was ‘opinion’, and which verbs are often used with the noun. The collocations feature is also useful for finding synonyms once you’ve exhausted all that Word, or the internet has to offer, with Sketch Engine being able to provide you with a helpful word cloud! We then explored some ready-made corpora, before creating our own using an EEA State of Europe Seas report, and were able to learn what MSFD stands for, and which verbs are often used with ‘seafloor’. Ana suggested some other sites that may be worth checking out if you’re interested in corpora: AntCon and WordSmith Tools, and explained that Sketch Engine allows you to create as many corpora as you want and can even download them to your own machine. She assured us that she doesn’t work for Sketch Engine, and that she’s just a big fan of the site! After her fantastic workshop, I and many other attendees are now converts! Thanks for a great session Ana. On 14th January a good-sized group of members (including five student members from the University of Leeds and the University of Sheffield joining for our first YTI event!) 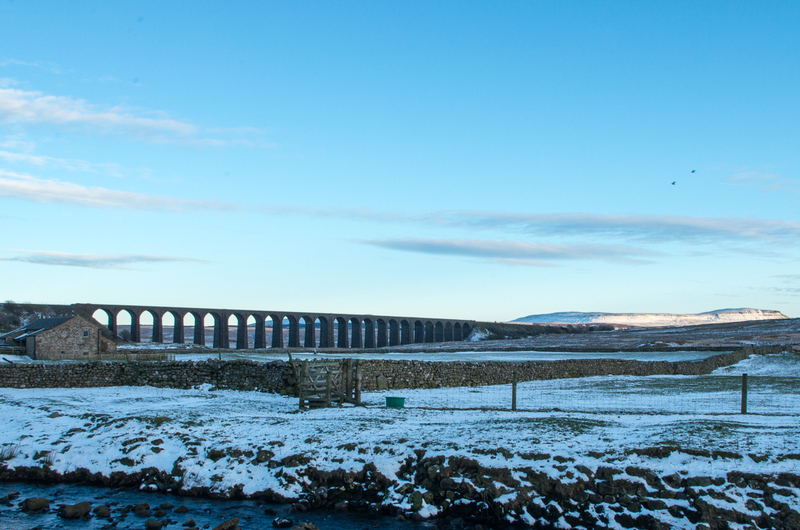 descended (or more accurately, ascended) onto the moors for this year’s Winter Walk. 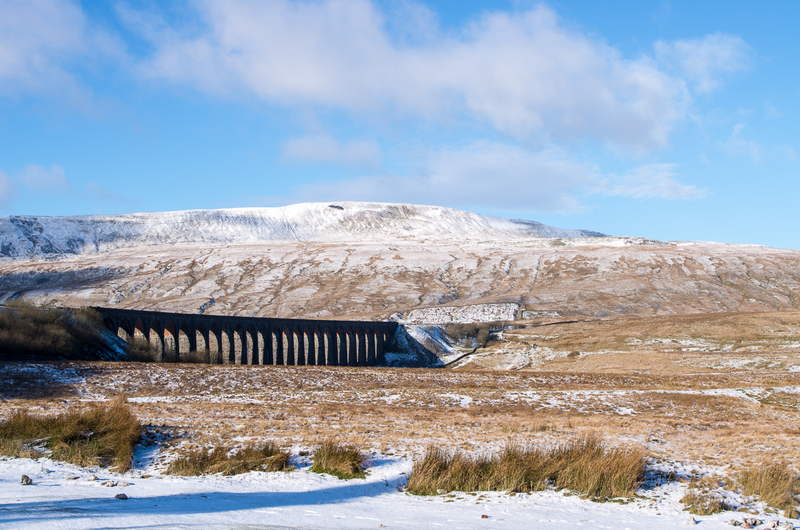 The route started at the The Station Inn (very important for a country walk) and followed the railway line north as far as Blea Moor Sidings, where we turned left under the tracks and walked south west past Ivescar. 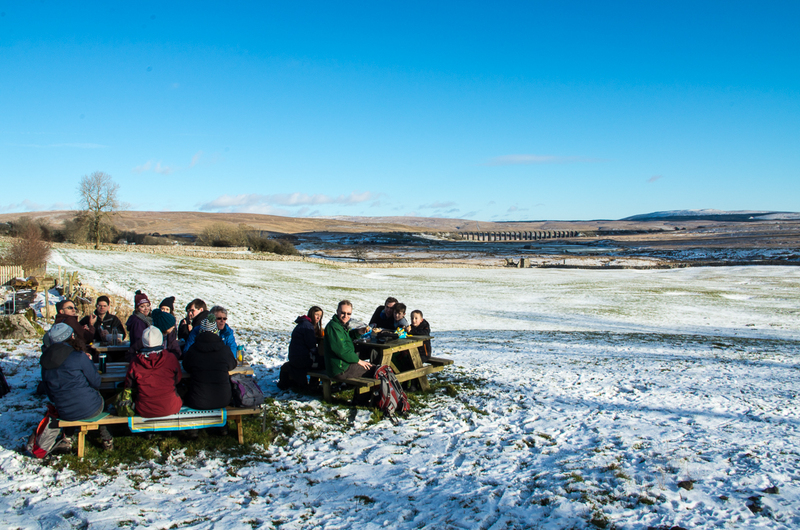 We then stopped for lunch at some very conveniently placed picnic benches in Broadrake and it was fairly unanimously agreed that the magnificent viaduct coupled with the wild and natural landscape made for some of the best dining views. After refuelling we set off again, heading south east by Ellerbeck Gill, before stopping for a second break at Chapel-le-Dale church, whose graveyard contains the bodies of the (many) navvies who died building the Settle-Carlisle railway. At this point a hip flask emerged from the pocket of one member of the party! We then walked up the B6255 for about a quarter of a mile before taking several paths to Gunnerfleet Farm, where we saw one of the various types of sheep Matt had promised along the way. We finally finished back at The Station Inn where we were greeted (grumpily in the case of the owner) by an open fire and well-deserved drinks. The group of students stayed a bit longer waiting for the train, and the clear skies meant that we got a great view of the stars! Thanks Matt for organising the route, I’m already looking forward to the Summer Walk.